The fine folks over at Slice Of Wax record have stepped up and made Dan Sartain's first ever, cassette only album available for the first time. They've made three different versions and unlike some other labels, they actually cut me a deal to order all three rather than jack up the price and charge an unnecessary premium. I actually hadn't planned on buying all three as the variant game is becoming a little overblown for me, but I couldn't pass up the deal and at the end of the day, I do want everything. I'll take a picture of the third version tomorrow as it warrants an individual shot, so what we have today is the standard black vinyl version and the more limited white vinyl. The quality of this reissue is pretty impressive. Thick card stock on the album cover, super high quality paper on the printed inner sleeve and a big old fat slab of wax. Quality is job one over at Slice Of Wax. Considering what the One Little Indian vinyl reissues of Dan's other records came out like, this is just stellar. Musically, it's an early feeling Dan Sartain album. It leans a little more towards the darker country and rockabilly stylings and is not at all out of place grouped with Romance In Stereo or Crimson Guard. 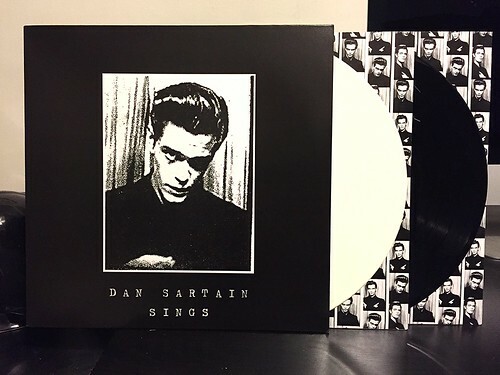 Dan Sartain Sings is probably not quite as realized as those two, but it's a strong precursor and shows Dan at an early age when he was still pulling his influences and ideas together. It's just another fun listen as is virtually everything in Dan Sartain's catalog. I'm pretty thrilled that Slice Of Wax made this available on vinyl as now I can finally say I have a vinyl version of every Dan Sartain album. And that's a good feeling.